Thistles Shopping Centre, Stirling today launched its retail marketing campaign for 2018, #STIRLINGSHINES, with the help of one of Scotland’s most inspirational young talents,13-year-old Lee Welsh. Aiming to discover the undiscovered, #STIRLINGSHINES will celebrate the achievements of local talent and give them the chance to shine. From undiscovered photographers, designers and artists to undiscovered chefs, musicians and sports talents, #STIRLINGSHINES will put the spotlight on these inspirational people throughout the year. In recognition of 2018 being the Year of Young People in Scotland, it is only fitting that local teenager Lee, whose own personal story is one of overcoming immense challenge with an inspiring, fighting spirit, should launch the campaign. 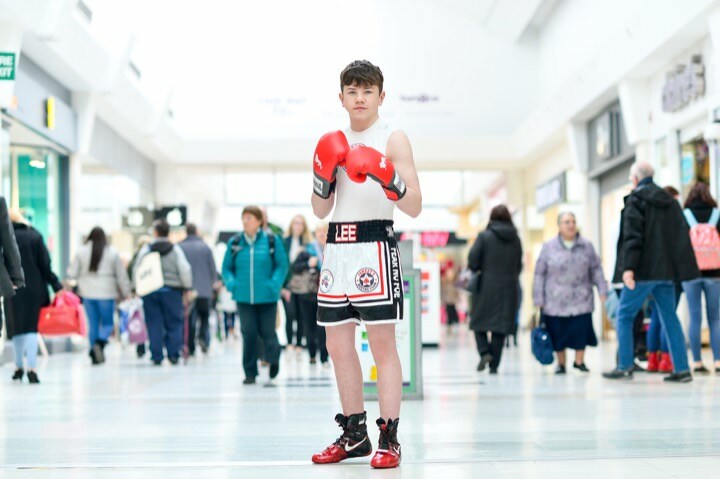 Diagnosed with non-Hodgkin’s Lymphoma in 2016, the young boxer from Larbert has battled cancer with a steely determination that belies his young age. Having recently completed an aggressive course of chemotherapy, the teenager now continues to defy the odds inside the ring with an incredible medal haul that is marking him out as one to watch on the boxing circuit. The 13-year-old Larbert High School pupil, who trains at Jonesy’s Boxing Club in Stirling, has been encouraged by the messages of support from many of his sporting idols, and astonishingly in the midst of his own successful fight back to fitness, is now an active fundraiser for other children battling life-threatening illnesses. “I’m really happy to be part of #STIRLINGSHINES and although this was my first professional photo shoot, it was fun. “I never knew when I started boxing that it would one day help me to prepare for my battle with cancer. “I’m not afraid of anyone or anything now, so my motto in the ring has become ‘fear no foe’. It doesn’t get any worse than what I’ve been through – that’s been my biggest opponent by far and I decided to beat it with a knockout. If being part of #STIRLINGSHINES helps raise awareness about how the illness can be beaten then I’ll be happy.